Gongshan Derung and Nu Autonomous County (simplified Chinese: 贡山独龙族怒族自治县; traditional Chinese: 貢山獨龍族怒族自治縣; pinyin: Gòngshān Dúlóngzú Nùzú Zìzhìxiàn) is located in Nujiang Lisu Autonomous Prefecture, in the northwest of Yunnan province, China. It has an area of 4,506 km2 (1,740 sq mi) and a population of 35,910 as 2012 census. Gongshan occupies the northmost part of Nujiang Prefecture, and in latitude has a range of 27°29’----28°23’N and in longitude has a range of 98°08’----98°56’E, covering an area of 4,506 square kilometers, bordering the Tibet Autonomous Region to the north and Burma to the west. The national boundary with Burma is 172.008 kilometers and the provincial boundary of Yunnan-Tibet is 135 kilometers. It is located in the central part of the Hengduan Mountains, and contains the valleys of the Salween, Mekong, and Irrawaddy. Gongshan is a small charming county with deep valleys and steep, overlapping and magnificent mountains and snow peaks. The water in Dulong river is green as a flowing jadeite in the four seasons. In spring, the flowers are fascinating in the intoxicating fields and gardens in Bingzhongluo. Gongshan is a mysterious place in Yunnan, even many people in Yunnan did go there. It’s a remote and closed county for its mighty mountains and gorges. The Biluo Snow Mountain, the Gaoligongshan Mountain and the Dandanglika Mountain make far away from the madding crowd. The author of the National Geographic Magazine—Joseph F. Rock came in this county during 1920s and early 1930s and he wrote several articles in National Geographic magazine. He described this place as the virgin land for no white man had ever came here before and it’s the paradise for explorer, photographer and botanist. Gongshan has rich products, numerous nationalities, colorful view and harmonious religions. China National Geography commended that every step, every gully, every mountain in Nujiang was a view. 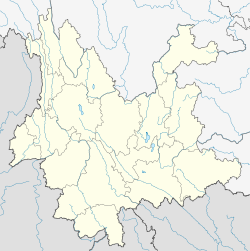 Wikimedia Commons has media related to Gongshan Derung and Nu Autonomous County. This page was last edited on 26 September 2018, at 00:21 (UTC).